Eerie things are going on in an old tool shed in a Hendersonville backyard. It’s nothing new, because strange things have been brewing in the madcap mind of Nashville TV horror host Dr. Gangrene for 10 years. 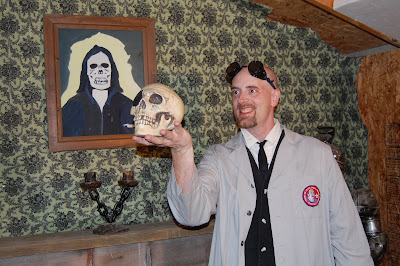 Gangrene, who is host of “Chiller Cinema,” at 1 p.m. Saturdays on WNAB-Channel 58, tapes his show in his secret hidden lab, aka Gangrene Manor, in the midst of suburbia, but all normalcy ceases once mortals cross this threshold. Turn to the right inside the tool shed turned studio and spy Styrofoam bricks painted to appear like a dungeon wall with curious laboratory equipment awaiting the doctor's maniacal touch. To the left looms a creepy Victorian-style mantelpiece with a pair of skulls, a fireplace, tattered old wallpaper and a midget knight in armor. And, if a visitor doesn’t watch his step, well, just beware of a trapdoor somewhere underfoot. The mischief maker behind this mixture of hilarity and hauntedness is a nearly average guy by the name of Larry Underwood, whose day job for 15 years has been as a graphic designer for the V.A. Medical Center and veterans’ events in Nashville. But on nights when the moon is full, or when it’s time to tape a show, Underwood transforms into the somewhere-between-the-goofy-and-the-ghastly Dr. Gangrene. “Dr. 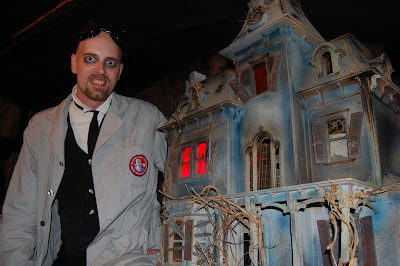 Gangrene is mad scientist with a large ego who loves all things monster and Halloween,” says Underwood. “It’s his wish to make it Halloween all year long. 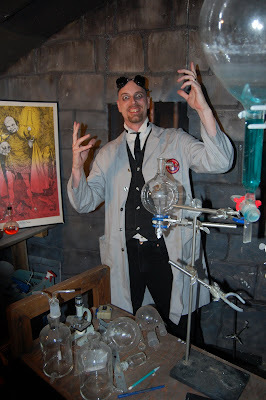 He endeavors to do so by showing bad monster movies and cooking up strange experiments in his lab. “Over the years Dr. Gangrene has become more like me. I’ve worn less makeup and the and costume has sort of changed,” said Underwood, who garbs his psychotic physician in white lab coat and black goggles. The self-effacing TV show host concocted his character after tiring of writing and drawing comic books with creative partner Chuck Angell. Doc Gangrene and his “Chiller Cinema” debuted July 1999 on the Hendersonville cable access channel and then hopped to the Nashville cable access channel and then to the UPN station before landing at The WB about three years ago. “When ‘E.R.’ was popular, I was getting stopped by people and told, ‘You look like that guy from ‘E.R.’, Dr. Green (Edwards).’ I thought it would be funny to do a twisted version of medical doctor from Dr. Green to Dr. Gangrene,” said Underwood. Nashville native Underwood graduated from Stratford High School before earning a degree in graphic design at Middle Tennessee State University. He and wife Karlee have three sons: Rob, 18, Ian, 17, and Luke, 12. He has had four sidekicks over the decade as Linda Wylie currently fills the bill as Nurse Moan-eek. Gangrene’s henchmen included Oogsley and Lump, while Karlee used to portray Nurse Deadbody and fortune teller Madame Fortune. Larry and Karlee celebrate their 15th wedding anniversary on Oct. 29. “We were gonna get married on Halloween at a bonfire, but my parents found out,” said Karlee. “They wanted us to have a church wedding. Underwood’s “Chiller Cinema” can take as much time as 40 hours to tape and edit an episode. For his efforts, he was nominated for a local Emmy Award and has captured two Rondo Awards (for classic horror excellence) for best Web site and for public service announcements that he has done for the state of Tennessee on littering and a fasten-seatbelts campaign. He also has met many stars of classic horror films at conventions while taping interviews for his show. Those include director George Romero (“Night of the Living Dead”) and actors Gunnar Hansen (the original “Texas Chainsaw Massacre”), Michael Berryman (“The Hills Have Eyes”), and Ben Chapman and Julie Adams (“The Creature From the Black Lagoon”). Recently, he has taken his horror hobby one step further as a vocalist with the horror punk Band Spookhand as he warbles about monsters and blood, etc. “I do Dr. Gangrene for the fun of it. I haven’t really made any money at it but do it just for love of the genre. I have to have a creative outlet of some sort and this is it,” says Hendersonville’s only dad who moonlights as a mad scientist on TV.